lager | Drink. Blog. Repeat. 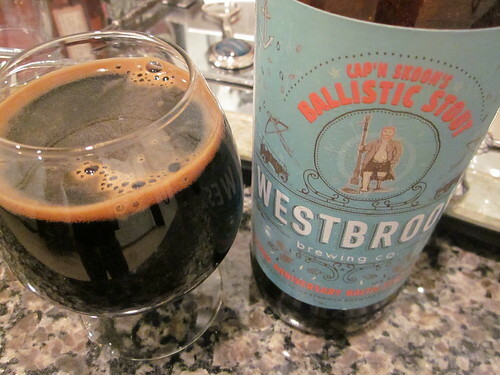 On Monday, I talked about my love for Westbrook’s first anniversary beer, their Mexican Cake imperial stout, dubbing it my favorite new beer of 2012. After close to a year since first trying that delicious brew, it still ranks up there as one of the best beers I’ve ever had. But alas, I must move on, and what better way to do that than with the second anniversary beer from the Mt. Pleasant beer factory? To honor their second year of existence, Westbrook recently put out Cap’n Skoon’s Ballistic Stout, which they’ve dubbed an “Imperial Baltic Stout,” a style they’ve created to classify this 10% imperial stout brewed using German lager yeast. I previously wrote about how Westbrook was crowdsourcing a name for the beer. They passed over the “(country) (dessert)” mold – much to the chagrin of some of my friends – and instead decided to honor Westbrook Head Brewer Scott Koon. The beer’s been hyped as a massive roasty bottle of goodness suitable for immediate enjoyment or delayed satisfaction. But the question still remains: Is it better than Mexican Cake? Let’s walk the plank and find out. The roasted qualities used to promote the beer are certainly strong on the nose, which has a full, sweeter dark chocolate note with the hint of rich coffee behind it. As opposed to most imperial stouts, which have a really thick, rich smell, the lager yeast dampens that and creates a richer, smoother overall quality to the nose while leaving it a bit dry. It’s still definitely an imperial stout, but smells a bit different from your usual entry in the style. There’s a very light bitterness on the front of the tongue that imparts a bitter dark chocolate flavor. An almost salty quality arises in the middle of the mouth, complimenting the burnt coffee flavors nicely. That roasted flavor continues into the finish and wraps up with this really dry, cocoa powder-like taste on the end. After a few sips, you get this chalky taste over you entire palate, which when mixed with the roasted notes gives off that salty quality. It’s very fitting for the name. The alcohol gives a very slight punch on the finish but hits you in the chest – and the head – after a bit. One of the biggest complaints I’ve heard about Cap’n Skoon is “it’s not Mexican Cake.” To be honest, I really hate that criticism, because to me it’s as if everyone is writing off the beer for being different. I think a lot of people went in expecting Cap’n Skoon to be a clone of Mexican Cake, or just destroy it all together. Mexican Cake was a phenomenal beer, I don’t deny that at all. But in its own way, Cap’n Skoon is just as great and inventive as it’s 1-year-old brethren. Using lager yeast in a stout is a nice and creative touch. It certainly made it one of the more unique imperial stouts I’ve had. Did I like Cap’n Skoon as much as Mexican Cake? Honestly, no, I didn’t. But by no means does that make it a bad, disappointing or lackluster brew. The roasted qualities were a perfect match with the dryness the lager yeast imparted. It’s still young, and I think revisiting it after a few months will give me and everyone else a better feel for what the beer really has to show. Cap’n Skoon is a great beer to cap off a big year for Westbrook. The growth and inventiveness of the brewery has really surprised me, and 2013 will certainly see both grow and expand even more. Lagers have been surprising me lately, in particular black lagers/Schwarzbiers. The combination of hoppy and roasted characteristics of black IPAs and the rich smoothness of lagers is a really refreshing and enjoyable blend that I really don’t give enough chances. 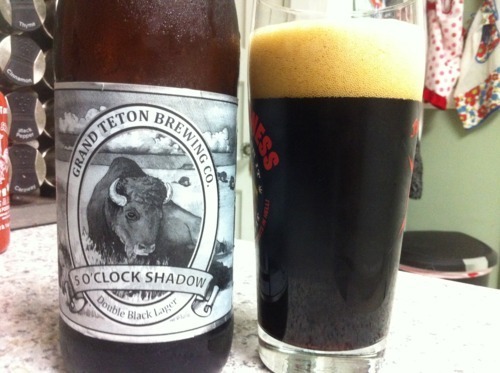 It helped when Grand Teton, one of those consistently good breweries I don’t think gets enough attention, decided to put out 5 O’Clock Shadow, their take on the style. Instead of keeping it at session levels, GT bumped up the ABV to nearly 8% by increasing the crystal and roasted malts, brewing it in the typical lager style and keeping it cold conditioned for four months. The color is a deep, deep brown that verges on black but still allows a little light through the edges of the glass, giving it a brownish amber tint. Two fingers of a pillowy brownish head top it off, but it dissolves pretty quickly. A little lacing but not much alcohol legs. There are some hops on the nose, but the smell verges more on that of a porter – strong dark chocolate with a hint of roasted coffee behind it. There’s a slight hint of dark fruits and some caramel sweetness with a very slight hint of alcohol. On the tip of the tongue is a subtle hop bite that give way to a medium-bodied mouthfeel. Coffee and the roasted characteristics come through toward the end but melt away into a really smooth, slight caramel sweetness. There are also bits of raisin and dark fruit flavors in there well. The yeast characteristic is very chewy, but the finish is much smoother. This particular bottle has been cellared for about four months, so I think the hops may have died down a bit. Additionally, the fact it’s bottle conditioned probably helped bump up the sweetness. Still, it’s an incredibly smooth and drinkable Schwarzbiers that’s awfully quaffable. I’m a bigger fan of ales than I am lagers. To me, there’s more room for experimentation with ales and a wider variety of styles to explore. It may also be because when I think “lager,” I think of the Big 3. But every once in a while, a lager comes along that surprises me. 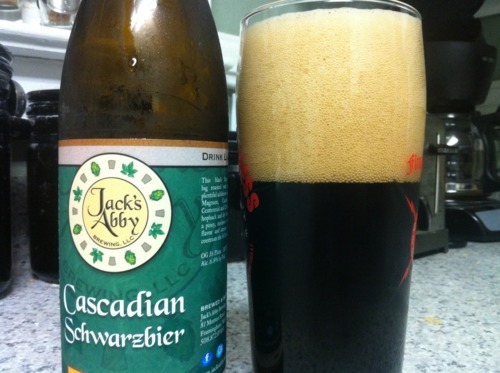 It happened with New Belgium’s Shift and again the other night with the Cascadian Schwarzbier from Jack’s Abby. I came by this bottle thanks to a trade with someone in the Northeast. Since it was an extra with some other ridiculously good beers – reviews to come! – I figured it couldn’t be that bad. I was right. First off, it’s brewed with Magnum, Cascade, Centennial, Cluster and Columbus hops in the boil, and then dry hopped again after brewing, making it a very hop-forward lager. Add that with the roasted malts and you’ve got a very smooth, clean lager with a great hop profile and a nice roasted backbone. True to its name, it pours pitch black, although there’s a hint of brown around the edges of the glass. There’s a huge three-finger foamy and pillowy head with light lacing that melts away quickly. I’m not sure if it’s bottle conditioned, but it sure looks like it. It’s very coffee forward on the nose with light hints of coffee and caramel. The hops are prevalent but very subdued. It smells as balanced as it tastes. On the front of the tongue is a slight bitterness from the hops. The lager yeast gives it a very smooth mouthfeel in the middle, and then the roasted malt notes come through at the back of the throat. There’s a hint of dark chocolate that comes through more as the beer warms. The lager yeast gives the beer a really rich, smooth mouthfeel. After the last few lagers I’ve had, I may have to rethink my opinion on them.